What makes Linux Mint so awesome? That, in itself, is quite a question. After all, why do we use Linux? It's one of those questions that can only be answered from the point of view of an individual's personal approach to their experiences with the operating system itself. For many, Linux Mint is the last bastion of non-commercialised Linux; an environment whereby they can still enjoy the pleasures of the desktop, without having to follow the trend of living in a tabletised world. For others, Mint has become the very best example of what a Linux desktop should be: fast, easy, pleasing to the eye, useful and productive. Others, still, see Mint as the ideal desktop for Windows refugees, or those who are trying out Linux for the first time, and want an operating system that essentially works 'out of the box', playing any number of media files from a variety of sources. Whatever the reason, we can be sure that Linux Mint has evolved into something more than just another Linux distribution, and that its popularity has fuelled its own style and usefulness. "I was writing for LinuxForums.org at the time, and eventually decided to try and host my own website, so I created LinuxMint.com. Version 1.0 (of the distribution) was a quick experiment to see how some of the ideas I wrote about in my reviews could be implemented. I was surprised to see people were more interested in it than in my articles." After a while, Clem started to get a flavour for what the people wanted, and he started to get the idea of how he would construct, and create, a distribution himself. Clem then went on to post more articles and tutorials. He saw the innovations of the time, and improved on them, adding his own ideas. "With version 2 onwards, there was an audience on LinuxMint.com which didn't really care about the articles at all and just wanted to see another release," says Clem. "Bianca (2.2) was the first release which was released with the ambition to establish a new Linux distribution and to compete with the very best." 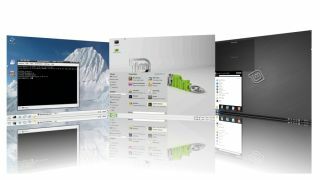 Linux Mint was being developed during a time that marked the end of the standard operating system desktop, and the beginning of a new-look desktop. Windows XP was starting to look its age, even in 2006, after just five years of life. It was riddled with security flaws, and its drain on system resources was starting to show, even after the launch of service pack two. Windows Vista appeared early in 2007, and with it came the final nail in the coffin for many disgruntled Microsoft users. Having an operating system that would only run perfectly on a very small population of computers was ridiculous. The hardware requirements for the full set of Vista features catered for roughly 5% of the machines, and users abandoned Windows in their droves. Linux Mint fitted in nicely, attracting Vista mutineers with an already-packaged Compiz 3D environment, along with media codecs and satisfying visual effects. Existing Linux users saw a desktop that combined all they wanted, without the headache of package installations, dependency woes and outdated control centres. However, the most significant impression that Linux Mint made was the fact that it listened to its community. The Mint team took into account all that was said, and religiously took heed of the Mint forums and suggestions. They accepted the contributions of the community, and improved their product based on the feedback from those who were using it in the many ways that only the public can. Can you imagine Steve Ballmer, or Tim Cook altering their systems based on user feedback?